Outstanding color printing, copying and scanning plus walk-up and PC fax in one compact, easy-to-use device. The C3530n MFP from OKI Printing Solutions is one of the smallest and fastest MFPs in its class. It’s an ideal solution for individuals and small workgroups who require a fast, reliable and affordable MFP that delivers high-quality color, ease of use and full multifunctionality. 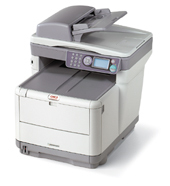 Key features of the C3530n MFP include: print speeds of up to 16 ppm in color, 20 ppm in black & white;1 a convenient USB front port for scan-to-memory stick; 10/100 Base-TX network and USB 2.0 high-speed connectivity; analog fax—walk-up or via host PC. 2 Larger files may require additional memory.